Huygens Probe Timeline - Solar System Planets And Moons Section. 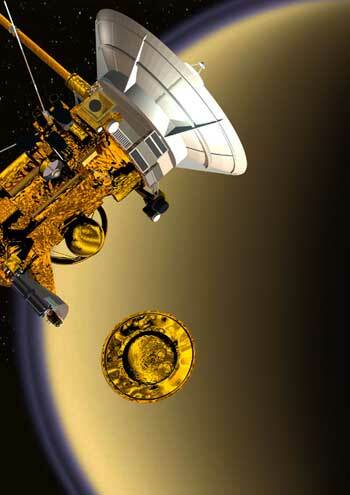 European Space Agency's Huygens probe. On Friday, January 14, the European Space Agency's Huygens probe will plunge through the atmosphere of Saturn's smog-enshrouded Moon Titan. If all goes as planned, the spacecraft will have two hours to record everything it can about the moon's atmosphere before it meets an unknown fate on the surface - it could land with a splash, splat, or a smash. Huygens will reach Titan at 1013 UTC (5:15 am EST), and then deploy its parachute a few minutes after that. It will reach the surface by 1234 UTC (7:34 am EST), and data about the journey will arrive at Earth shortly after.